This offering is for the original genuine pieces and is a restoration project. This car entered and attempted to but never qualified or raced at the Indy 500. Iit is never the less an historically significant car. This car was built and owned by Lou Moore. Moore is a little know Indy hero. First showing up as a driver in 1928, Moore ran nine races from 1928 thru 1936. He qualified first in 1932 and finished second in 1928 with third place finishes in '33 and '34. As a driver, Moore ran over 1300 laps in those nine years. In 1937, Moore returned as a car owner and scored his first two victories, in 1938 and 1941. After WWII, Moore came back in 1946 as the first true multi car team owner. 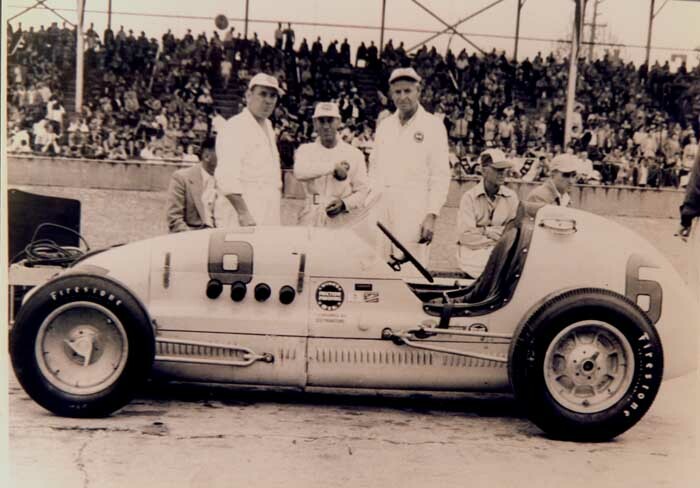 Moore's Blue Crown Spark Plug team ultimately ran a team of four cars from '46 thru '51, but in 1947 thru 1949, they owned Indy! 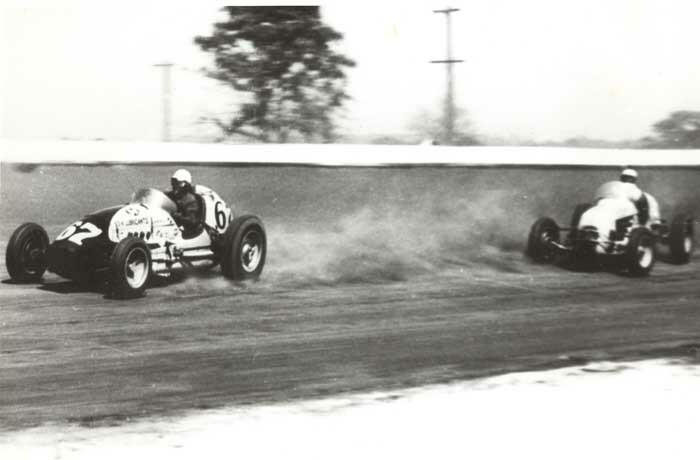 In those three years, Mauri Rose and Bill Holland had three wins and two seconds between them in Moore's Blue Crown cars. 1953 outside the Pit Wall, likely during practice. The car is a Big Car, an upright Champ Car. It is and has a true Big Car look and feel, look at the Roger Ward photo below. The information about the construction and 1953 was passed on to me by Howard Moore who is still living in Indianapolis. He will be 90 in the spring of 2008 and on the phone sounds sharp as a tack. 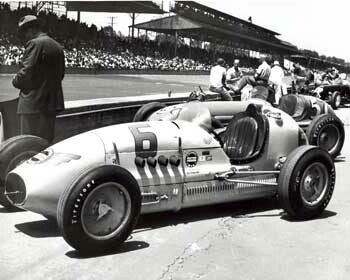 Built in Indianapolis by Lou Moore and his nephew Howard Moore for the 1953 Indy 500. The car was taken to the shop of Briggs Cunningham in West Palm Beach, Florida to build the body. Car originally had steering on right side and spring(s) for rear suspension. Howard Moore was not involved in this car in 1954. Lou likely sold it, to 3-L Racing. Drivers: Potsy Goacher, Duke Dinsmore. Changes made to the car for 1954: Steering changed to left side, torsion bars added to rear with bubbles in body to clear torsion bars. The rear radius rod frame mount was lowered. A new belly pan was made with a foot box and fewer louvers in side. This is the belly pan still with the car. The car crashed in practice, breaking the front axle off at the radius rod mount on the left side. Did Not Qualify. 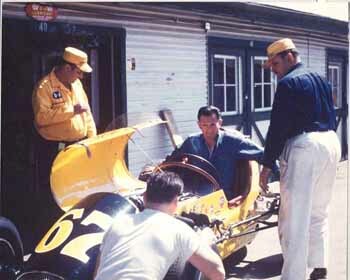 Duane Carter is not listed as one of the drivers, but there is a photo of him sitting in the car in Gasoline Alley. 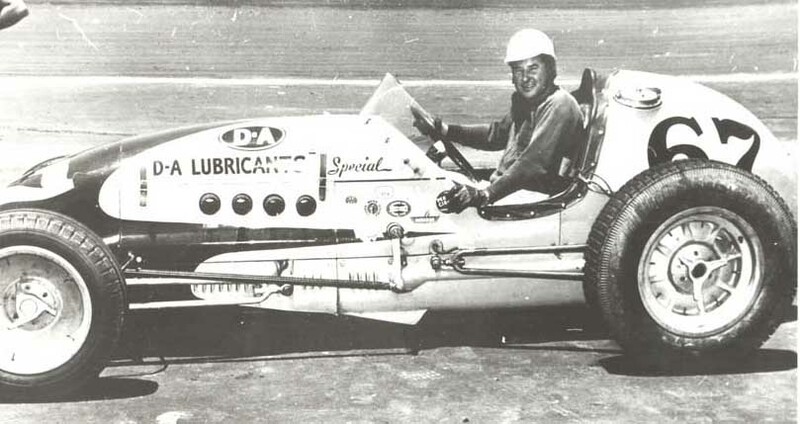 The car ran at Langhorne, PA in June of 1954 with Roger Ward driving. Other than the fact that Ward drove and that it was involved in some sort of mishap, nothing is know of what happened. There are a few pictures of Langhorne and Ward. 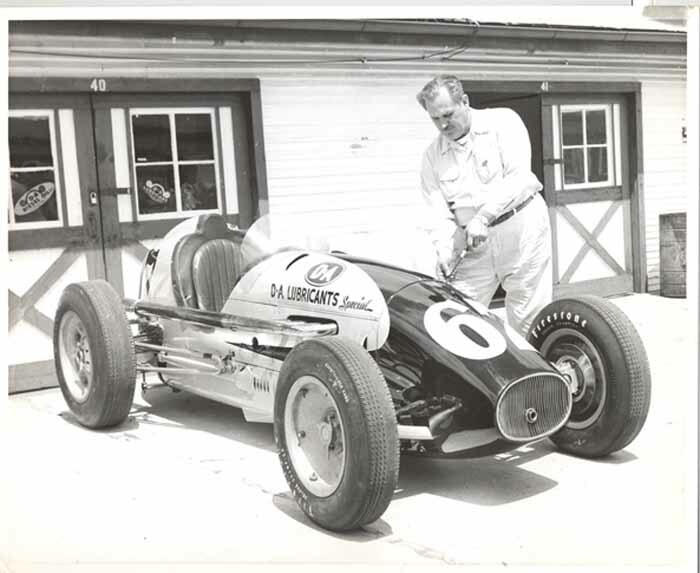 By the time this car was built, Lou Moore had probably lost interest in Indy, having won five times in his 22 consecutive Indy 500 starts and was moving to the new form of racing down South, NASCAR. He had a contract with Pontiac as was going to be racing in NASCAR when he suffered a fatal heart attack at a NASCAR race in Atlanta in 1956.